The pituitary gland is an important hormone producing gland, which is typically pea sized, sitting at the base of the brain approximately 12cm behind the tip of your nose. It produces eight different hormones that are important for a number of functions in the body. The hormones are important for, among other things, your general wellbeing, ability to manage infection and stress, appetite, energy levels, body growth, thirst and sexual function. Pituitary tumours are common, affecting up to 10% of the general population. The majority of pituitary tumours (99% or more) are benign, called adenomas, and are often detected incidentally whilst patients are having a brain scan for another reason. They are not cancerous and won’t spread to other parts of the body. They are typically slow growing and respond well to treatment if required, which can include surgery, medication and radiation. They can require treatment when they grow large enough to cause compression to surrounding structures, such as the optic nerves, or if they start to affect hormone levels by either compressing the normal pituitary gland, or producing excessive levels of hormones. Non-secreting pituitary tumours do not produce extra hormones but can affect the normal functioning of your pituitary gland by compression, this may stop your pituitary gland working properly and thus you may require hormone replacement. They can grow large enough to compress the optic nerves which lie just above the pituitary gland. If this is the case an operation is usually required to relieve this compression, and this may be urgent if your vision is already affected. If your tumour is not compressing the optic nerves the tumour may be monitored with interval MRI scans. Secreting pituitary tumours produce extra hormones, which can cause high hormone levels which require treatment. Usually these tumours are smaller when they are diagnosed. The treatment of these types of tumours can be medical or surgical depending on the type of hormone they produce. Prolactin secreting tumours (prolactinoma). These can often (85% of the time) be treated effectively with medication rather than an operation and are diagnosed through blood tests and MRI scans. Growth hormone secreting tumours. These cause a condition called acromegaly in adults and operations are often recommended for this type of tumour. Again they are diagnosed through clinical history and examination, and more detailed blood tests and MRI scans. ACTH secreting tumours. These cause a condition called Cushing’s disease in adults. They can be treated medically on a temporary basis but often an operation will be recommended. Pituitary tumours can produce any of the other hormones that the pituitary gland produces but these are less common than those listed above. Meningomas of the anterior skull base and bony tumours. What symptoms do pituitary tumours cause? Symptoms are variable, depending on the type of tumour and its size. Headaches are common but not always de to the pituitary tumour. All of these symptoms are usually gradual. 1-2% of pituitary tumours can expand rapidly due to a bleed within them, causing sudden headaches and visual deterioration. This is called pituitary apoplexy and is a medical emergency. If the pituitary gland is compressed and not functioning normally people can also suffer from generalised tiredness, weakness and loss of energy. Secreting tumours typically cause symptoms related to excessive circulating hormone levels. For example tumours that cause an excess of growth hormone (acromegaly) or cortisol (Cushing’s disease) can cause changes to your body and appearance. Observation with monitoring blood tests and scans, surgery, medications and/or radiotherapy are all treatment options. Which is chosen will depend on many factors including the type of tumour, its size, your age, general health and patient preferences. As most tumours are benign and slow growing many patients are managed on a ‘wait-and watch’ policy which involves regular clinical review and MRI scans. Treatment options will be discussed in detail with you in clinic, outlining the advantages and disadvantages of each approach to help decide what will be the best treatment option for you. Surgery aims to remove as much tumour as safely possible. Most tumours are removed endoscopically through the nose, called an endoscopic endonasal transphenoidal resection. Surgery for non-secreting tumours is typically recommended to preserve eye -sight, and is effective at improving vision in approximately 90% of patients in whom it is affected pre-operatively. Usually this improvement in vision is seen within days or weeks of the operation, but can continue for several years after your operation. If vision is severely affected before the operation it may well not recover completely. If your pituitary gland function is affected before your operation it may improve afterwards. Equally some patients have long term hormone deficits before and after surgery that require hormone replacement. Surgery for secreting tumours is aimed at removing, fully or partially, the tumour that is producing the excess hormones. This is to prevent the long term health problems that can occur from having an excess of certain hormones, and may avoid long term medical management to control hormone levels. The likelihood of successfully controlling excess hormone levels from surgery varies between tumours depending on their size and if they have invaded nearby structures, and will be discussed in depth with you beforehand. Pituitary surgery is safe, and the majority of patients recover quickly and well from surgery. less than 1 in 1000 risk of serious complications such as injury to major blood vessels, blindness and death. There is a 5-10% of less severe complications occurring such as infection, meningitis, bleeding from the nose, leak of cerebrospinal fluid requiring further repair and of stroke. Following surgery the normal pituitary gland may not function normally, requiring replacement of hormones. This is often temporary, but in some patients can be long term. There is a small risk of infertility. This will be discussed carefully with you before your operation if that is a consideration. There is a risk, as outlined above, that if your vision is affected before your operation it may not recover completely. There is the risk that some tumour may be left behind, and that further treatment such as further surgery, medications and/or radiotherapy. Before surgery you will have met with our surgical and endocrine team in clinic, and will have had a number of blood tests, visual tests and scans (usually magnetic resonance imaging scans). Once the decision to proceed to surgery has been made you will undergo a pre-operative assessment and be given a date for your operation. It is important that we are informed of your allergies, past medical problems, and of all medications that you take. Some medications, such as aspirin and warfarin, thin the blood and need to be stopped in advance of your operation so that their effects wear off making surgery safer. We will advise you on how long to stop those medications for before your operation. Surgery is performed under a general anaesthetic, and can take between 1 and 4 hours. Your surgeon will be able to advise further on the likely duration of surgery if you wish to know. Most operations for pituitary tumours take between 1-2 hours, complex extended surgery for craniopharyngioma can take 4-8 hours. A small camera, called an endoscope, will be used to look through to the back of your nose (figure 3). Therefore no skin cuts are required. Sometimes navigation will be used in theatre, for which a scan will have been obtained before-hand. 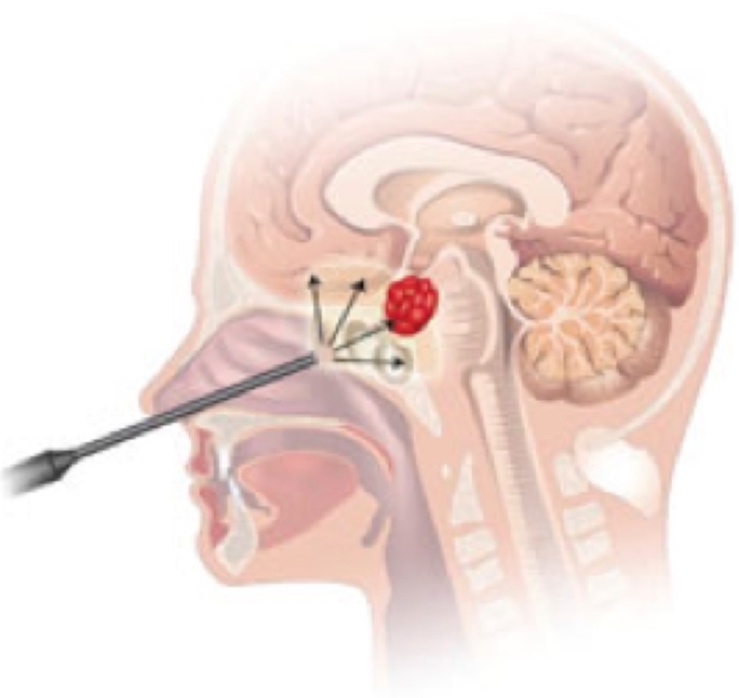 Your surgeon opens into air sinuses at the back of your nose to give access to the pituitary tumour, which is then removed with specially designed surgical tools. At the end of the operation absorbable materials are used in the space left by the tumour and nasal packs typically are not used. Sometimes, particularly for larger tumours, there is a small leak of fluid from the brain (CSF). Sometimes when this occurs a small piece of fat is taken from your abdomen, or fascia from your thigh, to help repair that leak and reduce the chance of its recurrence. This, along with other materials used in the repair, are naturally broken down and absorbed. If a leak of CSF is predicted before your operation your surgeons may also place a temporary tube in your spine, called a lumbar drain. Lumbar drains can be very helpful when operating on large tumours, and to also help repair defects at the back of the nose to prevent recurrent CSF leaks. Your surgeon may also plan an internal flap of mucosa to be used as part of the repair (called a nasoseptal flap), if there is a high risk of a CSF leak. After your operation you will be transferred to recovery and then to a Neuroscience bed. When you are on the ward you can be visited by friends and family. You will possible experience some mild headaches, a blocked nose and a transient discharge of blood stained fluid from your nose immediately after surgery. You will be given medications to help with headache, and any nausea if required. The nasal discharge is greatest in the first 48hrs then settles by 7-10 days from your operation. You will be able to eat and drink after your operation. We ask you to avoid hot fluids and food on the night after your surgery. Most patients will have an altered or no sense of taste or smell during the acute period that will improve over time. You will be encouraged to mobilise as soon as possible. Many patients find sleeping with their head elevated by two to three pillows helpful in the immediate post-operative period. You should avoid sneezing, coughing or excessively straining for the first 2 weeks after your operation to minimise disruption to the surgical sealant at the back of your nose. If you need to sneeze we would advise doing so with your mouth open and both uncovered. If you are constipated we would advise taking laxatives. If you have a persistent leak of clear fluid from your nose you should inform your medical team. This may occasionally indicate a CSF leak (cerebro-spinal fluid). It is important that this is detected and treated early, as there is a risk of meningitis occurring with ongoing CSF leaks. If confirmed you many require a further operation to re-pack at the back of the nose and/or insert a temporary fine tube in your lower back (lumbar drain) for a few days to help repair the leak. Thankfully the risk of this is low running at approximately 1% of operations and most patients with a nasal discharge do not have a CSF leak, we would however prefer to know if you are concerned. All patients are screened for this prior to discharge from hospital. You will be started on hydrocortisone medication after your operation, typically given three times a day . This is a precaution in case you are missing this important hormone after your operation. You will be discharged with it and an emergency injection of cortisol to be given if you became unwell at home, and will be checked if you require hydrocortisone in the long term at your first follow-up appointment 1 week after your operation. You will also be placed on a 2 litre fluid intake restriction immediately after your operation, and have the volume of fluids you drink and urine you pass measured by the nursing staff. Sometimes surgery to pituitary tumours can affect that part of the pituitary gland that regulates your thirst and fluid balance. Usually this imbalance is short-lived, but can require hormone replacement to control it. Blood tests are taken on the day after your operation and the following one. If your fluid balance is in the normal range, your bloods in the normal range and you feel ready to manage at home you will be discharged home usually two days after your operation (for example if you were operated on a Monday you would be discharged home on the Wednesday late afternoon). Sometimes you may need to stay in hospital slightly longer if there an imbalance of your blood electrolytes and fluid balance so that this can be treated. We advise you to continue to measure your own fluid balance at home for the week following your operation, until you are seen for your follow-up 1 week from your operation, and will be given advice on how to do this and what to look out for. At home we usually advise that you have support in the first 1 -2 weeks from your operation, as you are likely to feel more tired than normal and benefit from some help. It is usual to require 6-8 weeks of recuperation from surgery, although this does vary from person to person. We advise that you do not fly ideally for at least 6 weeks from your operation (international patients wishing to fly home can do so if there is no CSF leak and they have a normal CT scan after surgery). We would recommend not driving until you have had your post-operative check 1 week after your operation. If you develop worsening headaches, nose bleeds, vomiting, worsened vision or clear nasal discharge when you are at home it is important that you contact us as you may require assessment. If you feel you are passing excessive volumes of urine in relation to what you are drinking, feel excessively thirsty and notice on your fluid balance charts that your urine output is >200mls/hr for three consecutive hours or excessive to your input contact the ward you were discharged from. We will be able to call you back and give advice or arrange a review.